The Great Eastern Forest of the United States has several biological attributes of world significance, nearly all of them aquatic. It collectively shelters the greatest diversity of salamander, stonefly, fresh-water mussels and crayfish species in all the world. 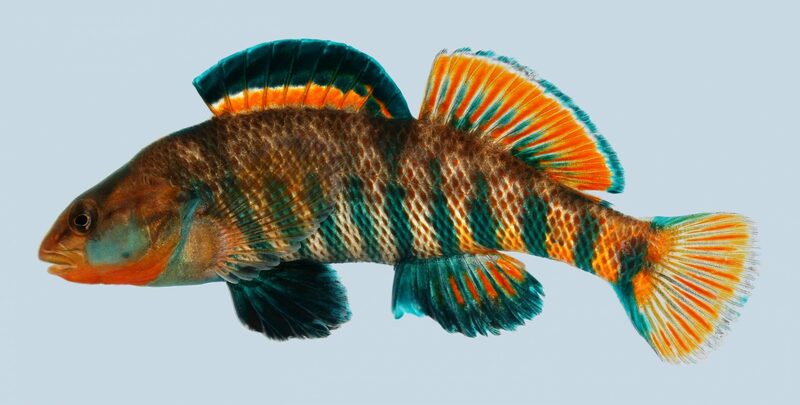 Thanks to the East’s fecundity, North America boasts 10% of the world’s turtle species and 10% of the world’s freshwater fish, including a splendid array of endemic darter species – small, gorgeously colored fish found in fast-moving riffles. In the lower run of Paint Creek before it reaches the Scioto, Paint Creek rebounds from the high impact of agricultural activities upstream. Here the waterway earns Ohio EPA’s highest designation of exceptional warm-water habitat. Over 40 species of fish live in the lower watershed where the preserve protects 1.25 miles of valuable river corridor. Junction’s Dickcissel Prairie was a 70 acre soybean field when the park was purchased in 2014. A specially designed prairie seed mix of fourteen wildflowers and five native grasses were planted the following spring in an attempt to attract pollinators and rare grassland birds. The plan worked! 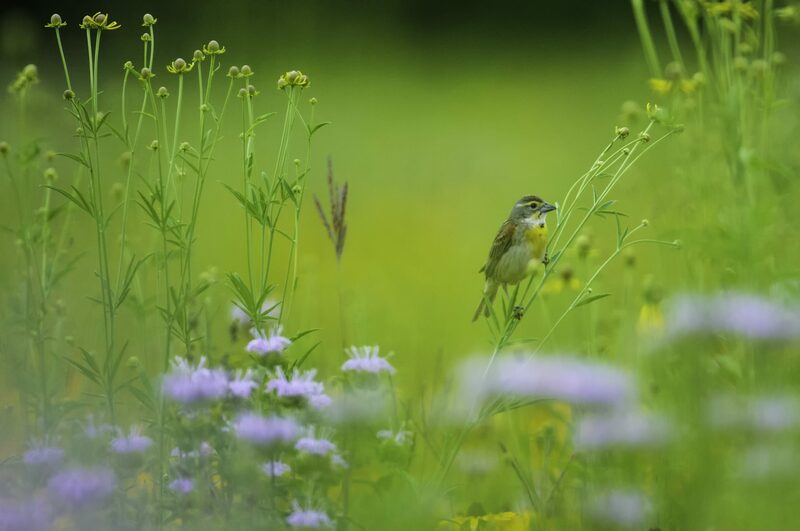 The field, now called Dickcissel Prairie is buzzing with native bees and bursting with rare grassland birds. Dickcissels and Grasshopper Sparrow – usually rare in our region – can be commonly heard along the Tippecanoe Darter Trail. The Grasshopper Sparrows are hard to see and even pick out untrained ears since their song sounds very much like an insect. The Dickcissels are on the other end of the spectrum. Perched on top of tallest vegetation, they sport the vibrant colors of a meadowlark, and belt out “Dic-dic-dic-se-se-se” right through the hot afternoons. Surely Dickcissels are the quintessential sound of a summer grassland.Other birds to watch for in the meadow include Song Sparrows, Yellowthroats and Indigo Buntings. The prairie explodes into flower in June and continues blooming through early August. 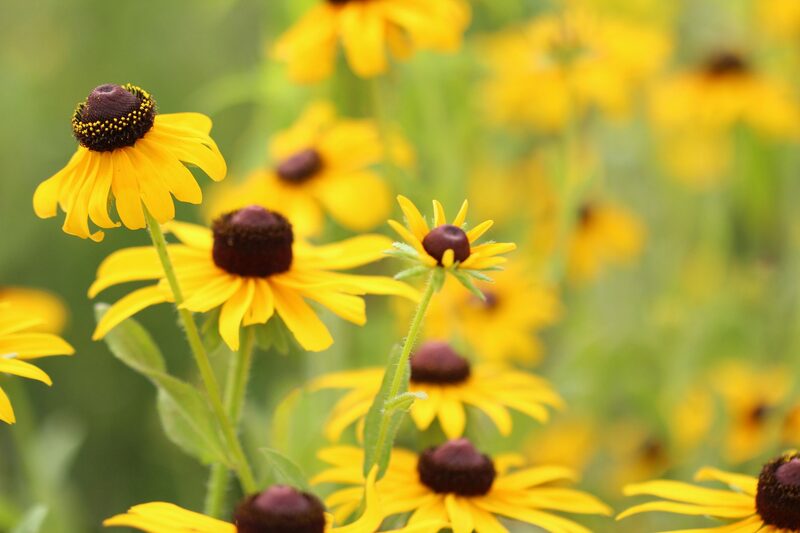 Watch for Black Eyed Susan, Purple Coneflower, Gray Headed Coneflower and Pale Bergamot, all providing colorful panoramas for Junction’s grateful hikers. The 100 acres of forest at Junction have undergone a remarkable transformation since the preserve’s purchase in 2014. At that time, non-native invasive shrubs and flowers, such as garlic mustard, bush honeysuckle and multiflora rose, had nearly displaced native wildflowers and shrubs. Through the hard work of staff and volunteers, including the excellent contributions of residents from Alvis Halfway House in cooperation with the Dept. of Corrections and Rehabilitation, Junction’s forests are now mostly cleared of the invasive species, leaving room for the native flowers, trees and shrubs to make a comeback. The preserve features two forest ecosystems. The Tippecanoe Darter Trail meanders through Dickcissel Prairie and then takes hikers into Hamilton Woods, a tall-canopy floodplain forest dominated by Sycamore, Black Walnut, Cottonwood, and Box Elder. In the spring watch for colonies of Virginia Bluebells. The river corridor is an especially good place to go bird watching. Listen for the calls of Yellow-throated Warblers, Cedar Waxwings, Warbling Vireos, Scarlet Tanagers, Summer Tanagers, Northern Orioles, and Orchard Orioles. The Star Brook Trail leads hikers into Oliver Woods, a forest on the steep bluffs that overlook the prairie and earthworks. Common trees include White Oak, Red Oak, Black Oak, Shagbark Hickory and Pawpaw. Listen for Peewees, Red-eyed Vireos, Scarlet Tanagers, and Wood Thrushes. Spring flowers include Twinleaf and Spring Cress. Junction’s 100 acres of woods need to be scoured every year to keep the invasive plants we have painstakingly cleared from re-establishing themselves. We need LOTS of volunteers. If you are interested in helping, please write info@arcofappalachia.org with your name, phone, email, and let us know you are interested. Also, be sure to subscribe to our email list to receive announcements of upcoming work days. The greatest biological asset of Eastern North America is found in its rich aquatic resources. 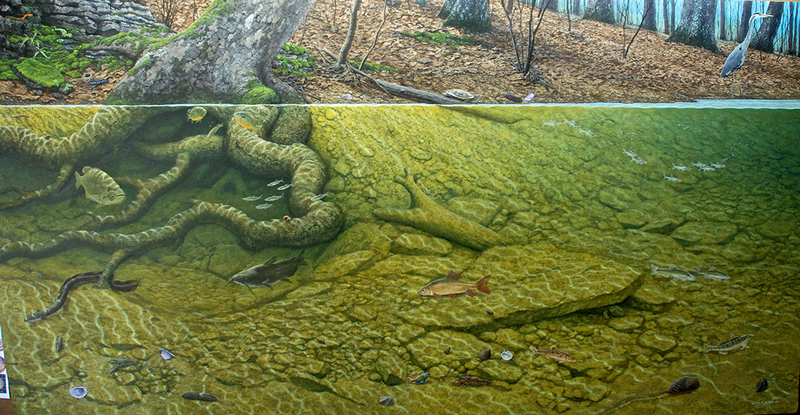 Appalachian Forest Museum Mural by John Agnew. Tippecanoe Darters are the tiniest of Paint Creek’s darters, growing no larger than 1.5 inches long. Photo by Uland Thomas. Rainbow Darters are gorgeous little fish living in the fast-moving riffles of Paint Creek. Photo by Uland Thomas. 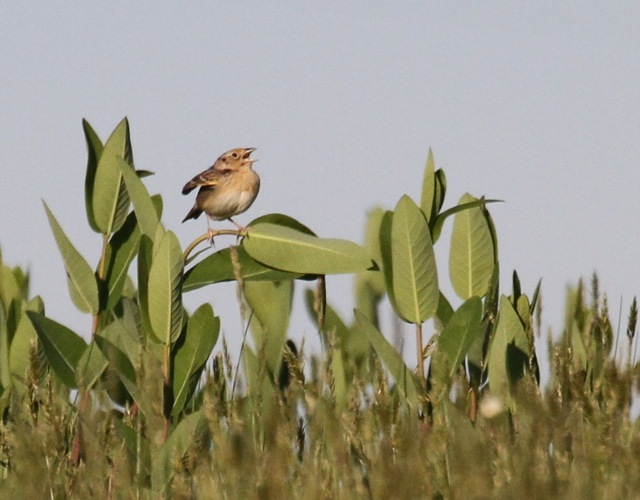 Grasshopper Sparrows are rare grassland birds in our region that adapted quickly to the habitat offered by Junction’s newly sown prairie. Photo by Julie Zickefoose. Dickcissels sport bold colors and beautiful songs. Watch for them singing from tall plants in Dickcissel Prairie. Photo taken in the prairie by Tom Croce.